Tres Generaciones tequila (or Three Generations tequila, as many call it in the States) is Sauza’s shot at the premium tequila category. It also tastes good and closely rivals other top shelf tequilas. Large distilleries face a quality vs. quantity dilemma. They usually go for top quantity and decent quality, but rarely will they make way for low production, better tequila. 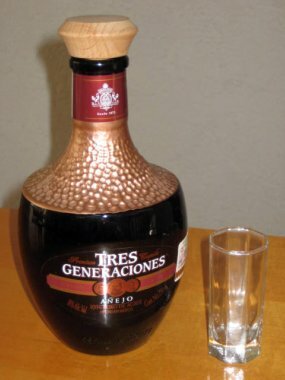 Unlike Sauza and Hornitos (the two other Tequila Sauza products), Tres Generaciones does many things right. Read on to find out what those are. Sauza’s premium blanco. With a 40% alcohol content and triple distilled liquor, expect a strong, unaged flavor. Sweet, floral, and a slight afterburn. I thought this drink was nothing too fancy... until a professional tequila taster reintroduced me to it. Boy was I wrong! Serve 2 ounces of this blanco into a cognac glass and let rest for 10 minutes. Bring the glass close to your nose, first sniffing the bottom side of the glass followed by the top. Know what I'm talking about yet? Aging: 4 months in American oak barrels. A good triple-distilled reposado. With a smoky presence, a vanilla background, and a strong earthy flavor, this Reposado is a definite improvement over its Blanco counterpart. Try it if your budget allows it. It’s not my favorite in this category, but it’s a huge step up from other Sauza reposados. Aging: 12 months in toasted American oak barrels. I love the aroma on this one. Pepper, raw agave, a little bit of butterscotch… interesting combination. The agave is quite strong for an anejo, but all in all it suits the liquor. The only “if” is the price, but it’s definitely worth a shot (pun intended). Sauza has done a great job with Tres Generaciones tequila. This goes on to show that large distilleries can produce great tequila… when they put their minds to it. It’s not as available as other Sauza brands but it’s tequila worth trying. May not be your favorite, but it's a solid step up from many other tequila brands in the market.